This randomized intervention trial examined the effects of yearly Family Check-Ups (FCUs) and tailored parent management training on parent report of problem behavior from age 2 to 5 years and teacher report of oppositional behavior at age 7.5. A multiethnic risk sample of 731 families in 3 distinct geographical settings who were receiving assistance from the Women, Infants, and Children Nutritional Supplement (WIC) program were randomly assigned to a yearly FCU. 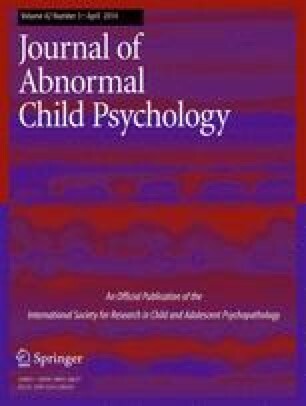 Intention to treat (ITT) analyses were used to examine overall intervention effects, and complier average causal effect (CACE) modeling was used to examine the effects of annual intervention engagement in the FCU on parent reports of child problem behavior from age 2 to 5 and teacher reports of problem behavior at age 7.5. ITT intervention effects were found regarding parent report at ages 2 to 5 and teacher report at age 7.5, indicating less growth in problem behavior for children in the intervention group than for those in the control group. CACE modeling of intervention engagement revealed that the effect sizes on parent- and teacher-reported problem behavior increased as a function of the number of yearly FCUs caregivers participated in. Findings suggest that embedding yearly FCU services within the context of social, health, and educational services in early childhood can potentially prevent early-onset trajectories of antisocial behavior. The increases in effect size with successive FCU engagement underscores the importance of a motivational approach to parenting support among high-risk families. This research was supported by grant DA16110 from the National Institutes of Health to the first, third, and fifth authors and grant MH20012 to the first author. We gratefully acknowledge the Early Steps staff and families who participated in this study and appreciate the assiduous editorial work of Cheryl Mikkola.